Today Family Equality Council joins millions around the world in recognizing World AIDS Day. 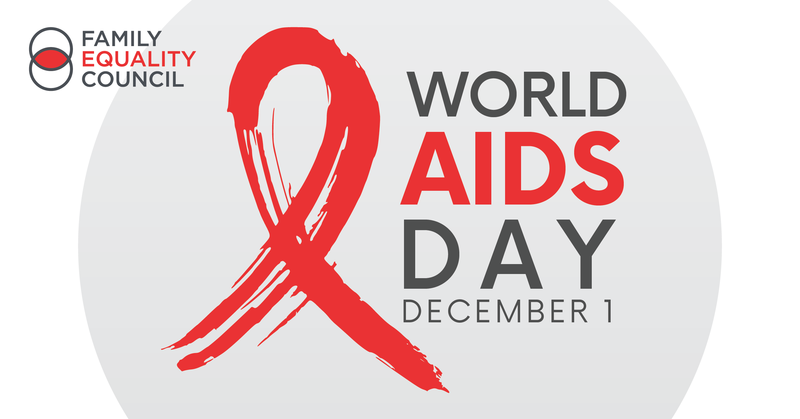 Beginning in 1988, World AIDS Day became a way to raise awareness about the AIDS pandemic. Storytelling remains one of the most powerful ways to foster community, increase representation, and acknowledge the lived experience of people from various communities. For World AIDS Day, we are lifting up stories within our community that show support for people living with HIV and commemorate those who have passed away from an AIDS-related illness. In our Outspoken Voices podcast, Family Equality host Emily McGranahan speaks with people within the LGBTQ from all walks of life, including those affected by the AIDS epidemic. In Grandparents and Advocacy, Emily interviews Dr. Ronni Sanlo, who was an HIV epidemiologist in Florida from 1987-1994. The conversation explores many aspects of Dr. Sanlo’s life, and underscores the stigma AIDS patients — and even those caring for them — experienced in the 80’s and 90’s. Dr. Sanlo, an out lesbian at the time, experienced stigma directed towards her, as a caregiver for AIDS patients. Her children, both in the custody of her ex-husband at the time, were told that they would contract AIDS by going near their mother, hugging, or touching her. “When I was doing this work, people died every day. They would get a diagnosis and then 3 months later they were gone,” said Dr. Sanlo. Molly Pearson also shared her story with Family Equality. Molly is a St. Louis resident currently pursuing dual master’s degrees in Social Work and Social Policy at Washington University, focusing on LGBTQ policy and community building. In another episode of Outspoken Voices, she shares about the AIDS-related death of two of her parents, and community responses to that information. In her episode, Power in the Telling, Person also talks about The Recollectors, a story database of people sharing personal stories to remember parents that were lost to AIDS. In both conversations, Pearson and Dr. Sanlo acknowledge that some progress has been made in regards to the stigma surrounding AIDS, but there remains much work to do. “Those times have changed, thank God, but we got other challenges today and the biggest challenge right now is this administration and the anti-gay laws they are reinstituting” Dr. Sanlo explained. In the United States, growing awareness about HIV/AIDS, as well as greater cultural representation of those living with AIDS, continues to shift perceptions and decrease stigma. The presence of people living happy, loving, full lives while living with HIV has increased in pop-culture, for example in shows like How to Get Away With Murder and Pose, where main characters have HIV. Despite those positive impacts, obstacles continue to emerge. The ‘anti-gay’ laws Dr. Sanlo refers are part of the growing list of license to discriminate laws and budget cuts that harm the LGBTQ community. For example, the Trump Administration recently proposed to cut Medicare costs by reducing the number of prescription drugs that must be made available to people with cancer and AIDS, and many other conditions. It is crucial to recognize that policies like these will disproportionately harm Black, Latinx, and Trans communities, who see startlingly higher rates of HIV/AIDS, due to discriminatory policies beginning in the 1980s. Whether fighting discriminatory laws and policies, or breaking down barriers to family-building, Family Equality continues to advocate for people living with HIV/AIDS and their families.